"Music ... For All Your Special Occasions"
Required by many venues, Dance Away Mobile Disco has a current PLI policy with Mobile DJ Network in the amount of £10 million. 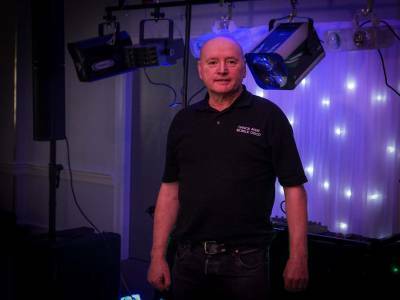 Also required by many venues, Dance Away Mobile Disco has supplied satisfactory evidence of holding current PAT inspections of their equipment dated within the last 12 months. A Method Statement, outlining Dance Away Mobile Disco&apos;s Health & Safety procedure for setting up disco equipment has not been supplied. Why do people choose to book Dance Away Mobile Disco? Fabulous reviews, pleasant and friendly and his discos look ideal for this occasion. He got in touch over the phone very promptly and won me over with his flexibility and experience. "Bill was the DJ at our wedding and was absolutely amazing from the minute we booked him right through to the wedding day. He was so accommodating and answered any questions we had promptly throughout the planning. On the night he arrived well in advance and the set up looked great, just what we had hoped for. Song requests were taken with no bother and the music that Bill played was absolutely brilliant and had everyone up all night. It was a great mix of music with something to suit everyone. I would highly recommend Dance Away to anyone and wouldn’t hesitate to book Bill again. " "Bill communicated well, right up until the big day. He played all the songs I'd asked for and knew what to play to get people up dancing. Happy Bride. " "I was very pleased with the Bill the DJ, he was very kind helping put up balloons and provided a great service with the music and karaoke. Would not hesitate to use again. Thanks!" "I couldn’t recommend Bill highly enough! I booked him for my hen night (35-40 woman all aged over 40). From the start he was so professional and put my mind at ease. Communication was really great! Even though I didn’t meet him until the day of the party I felt that I could trust him to make it a great night! I wasn’t wrong! When we first arrived he chatted to my mum (who’s in her 70’s) and even thought to dedicate songs to her which everyone loved! The dance floor was full all night, which considering the numbers could have been very different. I wouldn’t hesitate to book Bill again & I regret not already having him booked for our wedding! " "Fantastic in every way- super happy with the service and would highly recommend!" "very happy with this DJ would have no hesitation to hire him again"
"Bill was great, highly recommended. " "Bill was absolutely fantastic i will certainly use him again in the future, to be honest he's probably the best dj around for weddings etc and he was the best price and value for money by far"
"Bill was friendly on approach, professional, on time and open to requests. I would be happy to recommend him to others or would re-book him for future functions." "He quoted us 150GBP then when I told him I wasn't paying cash (which I thought he knew, what bride carries cash on her wedding day?) he demanded 180GBP on the day, phoned my husband during our meal to say he would be late but he wasn't, got our first dance song wrong and blamed me for it and even argued his case with us over the microphone while we 'danced'. He complained the entire night about the sound limiter to anyone who would listen even though nobody else minded at all and he had already signed the limiter weeks prior to the event, the music stopped for a while as our venue's 'WiFi wasn't working' and to top it off the second midnight hit he interupted myself and my partner saying goodnight to our guests and demanded payment in front of them (even though I had already paid half an hour prior). He was completely rude and unprofessional! My guests described the music choices as 90's school disco which wasn't great at all." 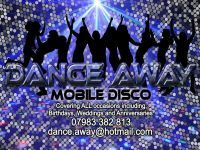 If you are contacting Dance Away Mobile Disco about an event, it's always a good idea to include the DATE, LOCATION, EVENT TYPE, AGE GROUP and TIMINGS to speed things up!